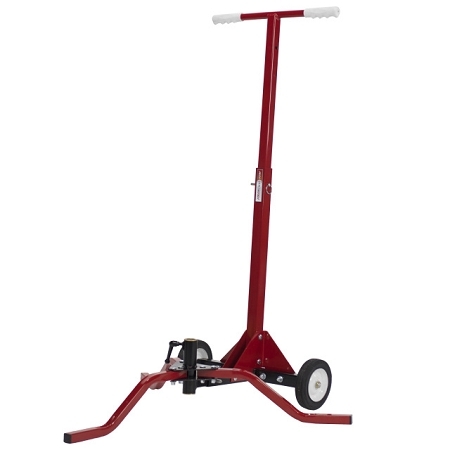 Discount First Pitch Transport Cart - Free Shipping! 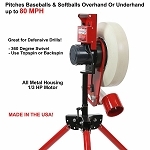 Pitching machines are not the easiest things to get from the trunk of your car to the ball field and back. 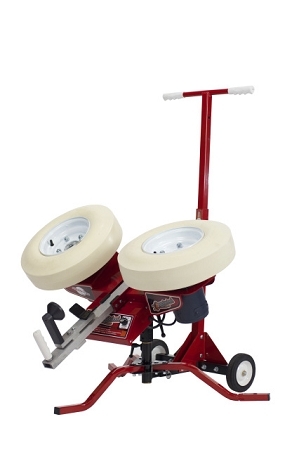 Two wheel pitching machines are next to impossible for one person to move and quite a struggle even for two people (they weigh more than 100 pounds). Fortunately, First Pitch now makes the First Pitch Transporter Pitching Machine Transport Cart. 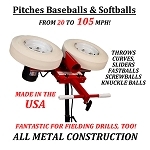 Simply place a First Pitch XL, Curveball, Ace or Quarterback pitching machine on the specially designed cart, lock it into place and easily wheel it from your car to the field and back. Much easier! Even better, you don't even have to remove the pitching machine from the cart. 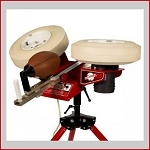 It can throw balls right from the cart, meaning you don't have to detach the pitching machine and set it up on its actual legs. It is important to note, however, that the pitching machine will sit a few inches lower on the cart than it would from its tripod legs. 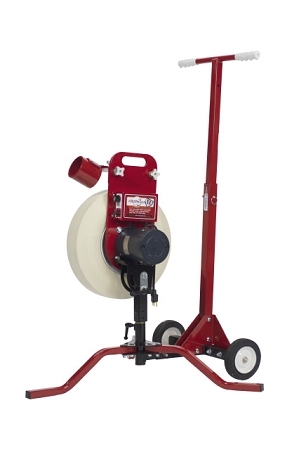 If you would like a First Pitch transport cart that will allow your First Pitch machine to sit as high as it does with normal tripod legs, you will need to purchase the First Pitch Transporter Pro. Like all First Pitch products, the Transporter features a 14 Day Satisfaction Guarantee and it Ships FREE from Pitching Machine Stop. Q: Currently have the baseball curve machine. I'm looking for a way to transport it in and out of our barn. Would like it to sit as high as it does on the transporter as it does on the stand. Is there a way to do that with the transporter? 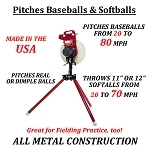 A: If you want to use your pitching machine while it still sits on the cart, the standard First Pitch Transporter will cause your pitching machine to sit a few inches lower than it would from its tripod legs. Only the Transporter Pro, which is more expensive, allows people to use their First Pitch machine from the same height that it would sit when using its normal legs. To ensure your satisfaction, the Fist Pitch Transporter includes a 14 Day Money Back Satisfaction Guarantee. Returned items must be in good, resellable, "like new" condition with original packaging. Unless returning an item that is defective, customers are responsible for the return shipping costs to First Pitch as well as the original actual shipping costs, whether they obtained "free" shipping or not. There is also a 10% restocking fee on all returned items. No warranty is offered on this product. No matter where you order a First Pitch Transporter from, NOBODY actually stocks them; they all ship directly from the manufacturer's warehouse located in Maple Plain, Minnesota. Therefore, the shipping time frame is exactly the same no matter what website you order from (we hope that it is this one!). First Pitch Transport Carts typically take 2-4 business days to ship from the time you place your order. They ship via Federal Express (FedEx) Ground and could take anywhere from a day or two to a week to get to you AFTER being shipped, depending on your proximity to their warehouse. We will notify you of your tracking number the moment we receive it from the manufacturer's warehouse. Click here to download an easy to read, printable PDF of the First Pitch Transporter assembly instructions.